There has been a lot of talk about the Country Club proposal, especially when it comes to the luxury rentals. We did some research to separate the facts from the misinformation circulating on social media. The Lojeta Group along with Ghitis Property Company are proposing to buy and renovate the Weston Hills Country Club & Golf Course, in addition to building a luxury community. 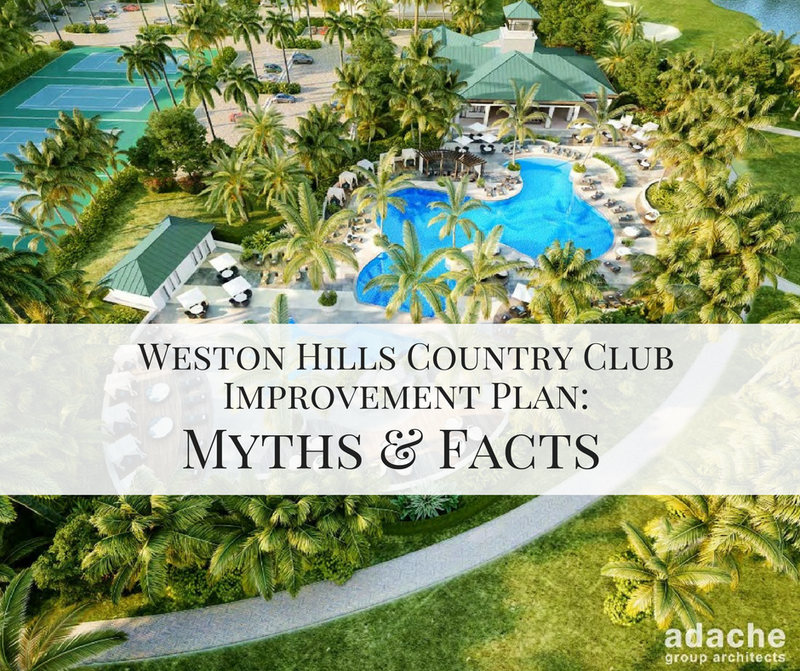 Myth: Multifamily residential units will hurt property values in and around the Weston Hills community. Fact: The biggest threat to property values is NOT restoring the country club to its former prestige and instead allowing it to fall into disrepair or become a public golf facility. The proposed active-adult development will allow the developer to make a $10 million-plus capital investment into the Clubhouse facilities and golf courses. By modernizing the facilities and boosting membership, we expect property values will rise. There are too many examples in South Florida of once-prominent golf clubs that have been neglected and become eyesores for neighbors (or even closed altogether), thereby lowering nearby home values. That is not what we want to happen in the City of Weston. According to the National Golf Foundation, 211 courses permanently closed in the U.S. in 2016. Myth: The new owner should be able to buy the club and make the necessary improvements without building the active-adult residences. Fact: For the past five years, current club management has been unable to charge initiation fees because of the facility’s poor condition. This has led to the lack of funds available for capital improvements. There is also significant deferred maintenance needed for the clubhouse and golf courses which will soon reach a breaking point. There is no doubt that the situation is economically dire. It is not feasible and would not represent a reasonable return on investment for the club owners to invest $10 million-plus of capital without revenues derived from the active-adult community development. Given the amount of funds required both immediately, and on an on-going basis, it is simply not realistic to raise membership dues to the level needed to restore the club to its prior condition and ensure a sustainable footing for the future. Myth: The active-adult community will further burden already overcrowded schools. Fact: The residents of the apartment community will be required to be over the age of 55. The apartment community will be designed and programmed to appeal to this demographic. As such we expect that there will be no impact to the school system. The development team has purposely chosen to build an age-restricted community in order to satisfy the concerns of the Weston citizens regarding the potential impact on the school system. The age restriction will be legally binding. Myth: The multifamily residences community will make Weston Hills less secure. Fact: The community will be a luxury building with professional management and 24/7 onsite staff. Residents will be subject to strict background checks and minimum household income requirements. In contrast, there are no restrictions on who can own or rent the more than 2,000 homes that currently exist around the community. Nationally, the average age of residents in 55+ communities is greater than 70 years old. Without a doubt, the demographics of the proposed community will fit seamlessly into the serene and safe environment of Weston. Myth: Homes with water and golf course views will be blocked by the new residences. Fact: At the request of the city, skilled architects working for the developers prepared views corridors from various areas around the development to demonstrate clearly that most of the building will be hidden by existing vegetation. At greats cost, the city is requiring the development team to engage in significant landscape architecture and tree planting to ensure that the apartment community blends in beautifully with the existing environment. Myth: The development team is going to cut a road from the apartments directly to Royal Palm Drive forcing a reconfiguration of the 16th hole on the Players Course. Fact: The proposed project does not require an additional roadway out to Royal Palm. The 16th hole on Player’s will not be altered. Myth: The new residences will create significantly more traffic in and around Weston Hills. Fact: At the request of the city, the development team performed a traffic study in the middle of the week in February, during the busy winter season. Engineers concluded that the addition of new residents would not adversely affect existing traffic conditions. Myth: The new residences will negatively impact already long lines at the WHCC east gate. Fact: The development team is offering Weston Hills a high-tech solution to eliminate existing long guest lines. Residents will be able to send their guests a barcode to their smartphone that gives their guests the ability to enter through a “Residents Only” lane for a pre-determined amount of time. Myth: The luxury community will burden Weston’s sewer and water system? Fact: Not at all, the City has excess capacity.